Now in its 11th year, this two-day symposium has been planned for the providers who care for patients with rheumatic disease. Given the wide variety of rheumatologic disorders, and an ever-increasing number of diagnostic procedures and treatment options, it is necessary to provide clinicians with information about strategies for the early diagnosis of these conditions, novel state-of-the-art diagnostic tools, and opportunities to utilize the most effective treatments to ensure optimal patient outcomes. Discuss treatment strategies in antiphospholipid syndrome. Discuss the use of current and emergent biologic agents in the treatment of rheumatoid arthritis. Discuss current treatment in the management of Sjogren’s syndrome. Identify lupus nephritis and other renal manifestations in patients with rheumatic disease. Appraise current management approaches in the diagnosis and treatment of spondyloarthropathies, including PsA. Recognize ophthalmologic issues associated with rheumatic diseases. Outline screening, risk factors and therapy in the rheumatic patient with pulmonary hypertension. It is the policy of the Johns Hopkins University School of Medicine that the speaker and provider disclose real or apparent conflicts of interest relating to the topics of this educational activity, and also disclose discussions of unlabeled/unapproved uses of drugs or devices during their presentation(s). The Johns Hopkins University School of Medicine OCME has established policies in place that will identify and resolve all conflicts of interest prior to this educational activity. Detailed disclosure will be made in the activity handout materials. 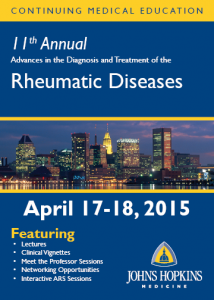 For free access to our 2015 Rheumatology course, please visit our registration page!